GameStop Opens "Store of the Future"
GameStop has debuted its "store of the future," a high-tech, high-engagement location that brings together conventional retail sales with digital content, rewards programs, demos and more. A digital future is bad news for conventional media retailers. Just ask Blockbuster, whose struggles to stay afloat are looking more and more like the final throes of death. No company is a likelier candidate for that same ugly fate than GameStop, yet GameStop appears to be staking its future on a continued retail presence, albeit one that's a little bit different than we're used to. The company recently launched its vision for the future with a new store in Palo Alto, California. 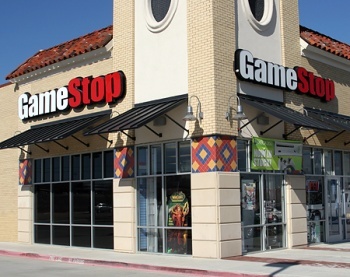 Along with conventional game boxes, the store also offers downloadable and Flash-based games via a PC connected to the online game portal Kongregate, which GameStop bought last month, along with demos running on large displays, reward program kiosks and more. A large "trading center" also features prominently, emphasizing GameStop's continued focus on the used game market. To accommodate everything, the new location is roughly twice the size of conventional GameStop outlets. The kiosks use an optical scanner to read PowerUp Rewards Pro cards and display individual customer information, like purchase history and wish list, that can be shared with friends. An "Interactive Game Guide" will instantly show information on each game in the store and also provide options to purchase digital content for the Xbox 360 and PlayStation 3, which can then be downloaded at home. Digital pricing will be the same as buying directly from Microsoft or Sony but as GameStop President Tony Bartel pointed out, purchases made through GameStop will count toward reward programs. Bartel said the reward programs and kiosks appear to be very popular with customers at this point and the company is getting them into stores as fast as it can. Will it be enough to keep GameStop a going concern? CEO J. Paul Raines said the rate of new store openings has slowed, although the company nonetheless opened a net 99 new locations in the first half of the year. Clearly there's still faith in the power of retail, but as the Blockbuster experience has taught everyone, it's never too soon to get out in front of the future.